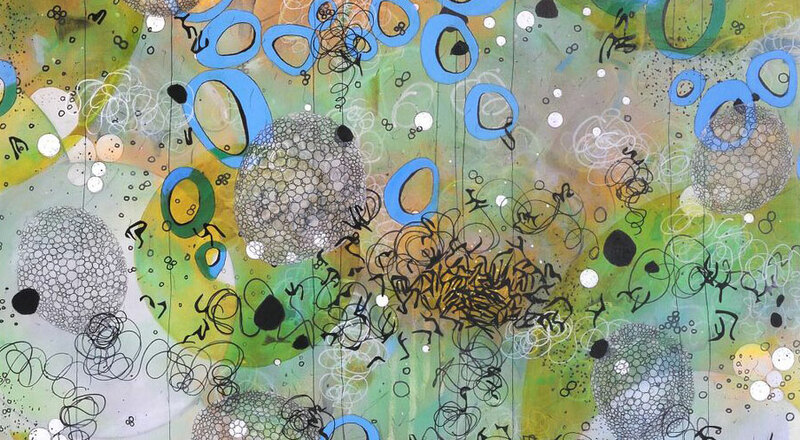 Washington, DC artist Betsy Stewart creates luminous paintings of microscopic and macroscopic nature hidden from the naked eye: the layered interconnectivity that could represent origins of life in a drop of water or systems in the vast cosmos. Betsy Stewart is a both a nationally and internationally recognized artist. Stewart’s recent solo exhibitions include venues in Denver, CO, NewOrleans LA, Vancouver, BC, Richmond, VA, and Washington, DC, as well as group exhibitions in New York, NY, Art Basel, Miami, FL, Toronto, Canada, Aix-en-Provence, France, and Montevideo, Uruguay. Stewart’s work is included in museum and corporate collections such as Corcoran Gallery of Art, Kreeger Museum, Ogden Museum of Southern Art, Adirondack Museum, Bellagio Hotel, Embassy of Finland, Washington Convention Center and World Bank Headquarters. Her work has been exhibited in many worldwide American embassies as part of the US Department of State’s Art in Embassies Program. In addition to other awards, Stew art has been a recipient of four Award Grants from The DC Commission on the Arts and Humanities.